Travis Birr ran in Grandma’s Marathon in Duluth, Minnesota, with a weightier goal than just crossing the finish line. 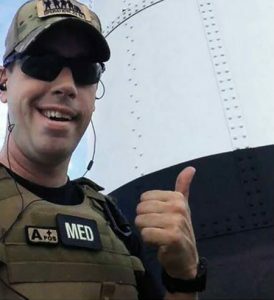 He ran in military body armor to raise awareness about suicide among military vets and active-duty personnel. Running a marathon is hard. Covering the 26.2 miles while wearing 25 pounds of military body armor is (we have to assume) immeasurably harder. But it's a load Travis Birr was more than willing to bear when he ran Grandma's Marathon on June 17. The added challenge wasn't for bragging rights. Travis, a combat medic with the U.S. Army Reserve 477th Medical Company, based in Duluth, Minnesota, suited up to raise awareness about the high suicide rate among military veterans and active-duty service members. "It's going to hurt," Travis told the Duluth News Tribune before the race, adding that "the amount of pain that I'm going to be going through is only minimal compared to what our at-risk veterans go through on a daily basis." Travis tells the paper he learned about that pain in 2013, when a vet he knew committed suicide. That prompted him to get involved with Operation: 23 to Zero, an organization that works to "curb the massive rates of veteran and military suicide through awareness and providing a network of fellow military members to connect with for help and support." The organization's name is a reference to the estimated 22 veterans and one active-duty service member who commit suicide each day, and Travis now runs its Minnesota North chapter. His hope is that his unusual running gear, which included a list of names of Minnesota vets and active-duty personnel who died from suicide, will help raise awareness among civilians. "I truly believe that the civilian community doesn't realize how important they are to this equation in terms of helping our veterans," Travis, an emergency medical technician with Mayo Clinic Medical Transport's Gold Cross ambulance in Duluth, tells the News-Tribune. 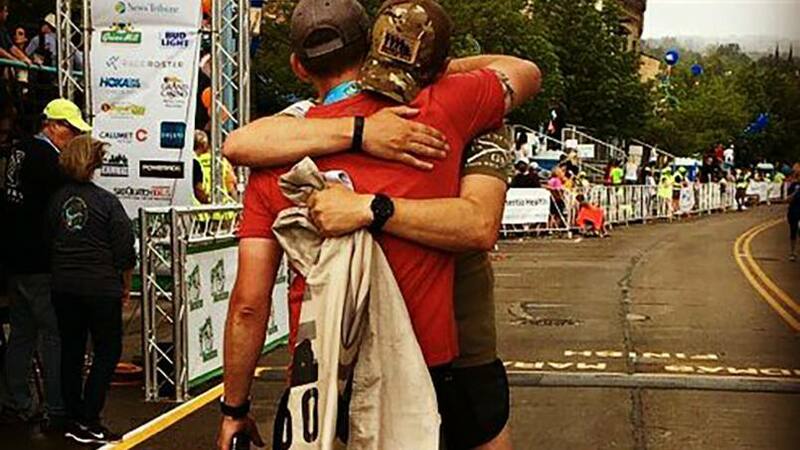 We checked in with Travis after the race, and he tells us that some of the most meaningful moments along the course came after other runners noticed the list of names and asked "if they were fallen brothers overseas in combat." Each time, Travis explained the names represented vets who had "lost their lives to suicide." The reactions, he tells us, "spoke for themselves. There was shock, sympathy, and a few racers who broke into tears after learning of the epidemic of military and veteran suicide." We'll salute you if leave a comment below and share this story with others.